Over the sample period, gross annualized factor alphas for global equity portfolios range from 0.88% (size) to 5.11% (quality). Gross tax alpha is markedly lower for the relatively complex (constrained) global quality and minimum volatility/value portfolios. 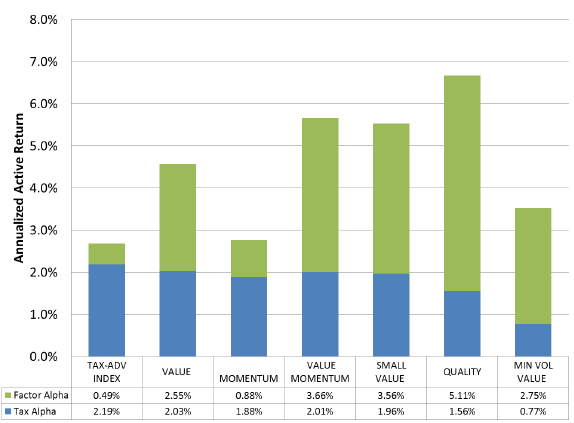 Tax alpha is uncorrelated with pre-tax factor alphas, suggesting a diversification benefit. Results are qualitatively consistent over the last 10, 15 and 20 years. Results are similar for portfolios constrained to U.S. stocks and factors. The most dramatic differences are that the quality and minimum volatility/value factor tilts are much less effective for U.S. stocks. The following chart, taken from the paper, summarizes gross annualized tax and factor tilt alphas (active returns) for a capitalization-weighted global portfolio (TAX-ADV INDEX) and the above six factor-tilted global portfolios relative to the MSCI ACWI over the sample period. Green (blue) bars represent factor tilt (tax harvesting) contributions to total annualized alpha, which ranges from 2.7% for the capitalization-weighted portfolio to 6.7% for the quality-tilted portfolio. The relatively more constraining formation rules of the quality and minimum volatility/value portfolios suppress tax alpha. Results suggest that global equity investors lacking confidence in factor alpha and having short-term gains may prefer capitalization weighting. Investors confident in factor alpha and sensitive to taxes, but not averse to volatility, may prefer the value/momentum and small/value tilts. Investors confident in factor alpha, insensitive to taxes and averse to volatility may prefer the quality and minimum volatility/value tilts. In summary, evidence suggests that tax harvesting of capital losses to offset gains boosts gross performance of taxable smart beta portfolios, less so for complex than simple factor tilts. Reported returns are gross, not net. Incorporation of trading frictions from monthly portfolio rebalancing/loss harvesting would reduce returns. Since turnover may vary by factor tilt, impact of frictions may vary across smart beta portfolios, thereby changing their performance rankings. Results are for U.S. investors and capital gains tax rules.